Motorola Xoom, the first tablet running Android 3.0, a device based on the popular Tegra 2 system, which for some time there in androidowym world. The device has two cameras, a rear 5MP, which can record video up to 720p @ 30fps and 2MP front, intended for video calls. 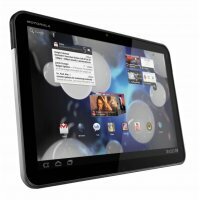 Xoom is equipped with a screen size of 10.1 "and a resolution of 1280 × 800th Tablet can also play movies in HD 1080p. Remember that entered PIN on the website must be exactly the same as PIN entered in the setup program on your Motorola XOOM.